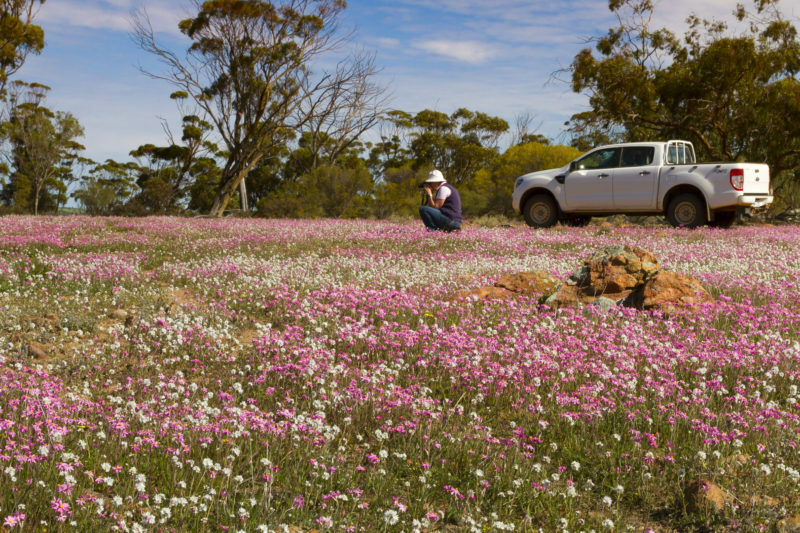 The wildflower season is one of the eastern Wheatbelts’ most precious natural treasures attracting visitors and special interest groups annually. Woodlands come alive following significant winter rain as trees, shrubs and annuals produce a spectacle of colour and scent. To appreciate these remarkable displays there are many nature reserves with walk trails throughout the region which are rich in flora species. Open woodland, granite outcrops, sand plain country and extensive salt lake systems give rise to a great variety of flora species of which many can be found in nature reserves and roadside verges in these habitats. The best times to visit for wildflowers are during July to October, but remember this spectacular floral event is very much dependent on seasonal rainfall. Over 980 species have been recorded in the Shire of Merredin alone. Species of acacia and eucalypt make up the majority but also included is some 47 species of orchids and numerous species of hakea, grevillea, verticordia and other varieties of heath land plants. As flowering of the flora is very dependent on seasonal conditions and rainfall, please check closer to the date of your planned visit.